*With its space saving design and timeless style the Haffa Crib is a beautiful addition to any nursery. For the complete look don't forget "The Other Haffa" Changing Table. Space Saver - Crib and changing table combo only take up two tiles instead of the normal four. 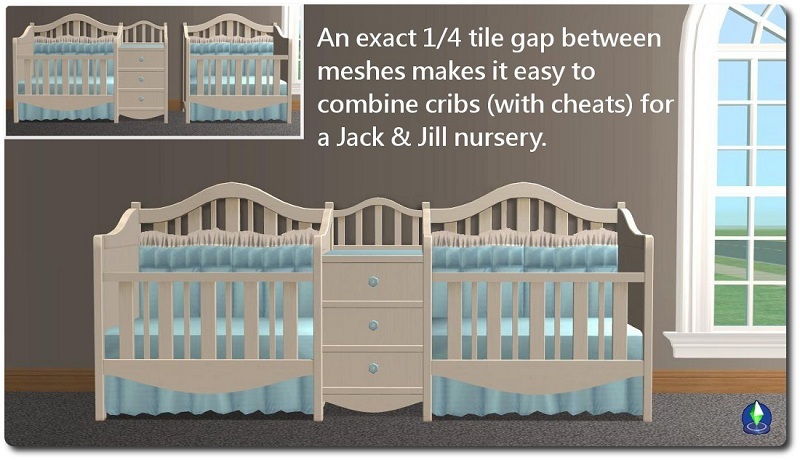 You would need four tiles for the Jack & Jill setup pictured though (2 cribs and 1 changing table) since the crib by itself is larger than 1 tile. Changing table is updated for the nanny to use if you have AL. *I pretty much just copied the desc. text from the site because I'm sick with a cold and don't care, but I just had to share this wonderful find. Can't wait to see it in my game! NixNivis;9374 Wrote: I don't know if you've seen it already, but this just got featured on MTS. Way to go, Honeywell! Yup, it is well deserved. Honeywell has just been getting better and better and this is one of her best sets so far.